Make a 999 call and the SECAmb call-taker will assess the situation and, if needed, the rescuer will be given the location of the nearest PAD and the code to unlock the box. Keep the line to the call-taker open so that further advice or help can be given. Make sure you have the code clearly in your mind before heading off for the nearest PAD. Without it you will not be able to open the box. 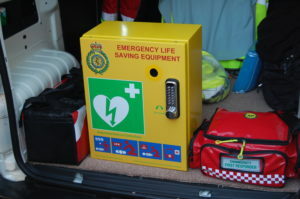 The box contains a Smart Defibrillator which will tell you what to do and when to do it. With the line kept open, the call-taker will be there to help.